Sushma Swaraj has over eight million followers on Twitter and is widely appreciated for her personal engagement with those who ask for her assistance, be it for passports or visas or to return home from conflict zones. Sushma Swaraj is among the government's most responsive ministers on Twitter. 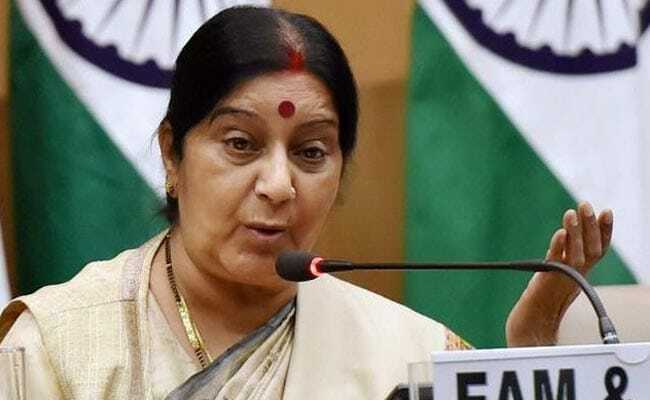 New Delhi: If you are in a foreign land, the Indian embassy is your friend - Sushma Swaraj today modified her catch-phrase for Indians across the world to convey, light-heartedly, that as far as her government is concerned, even space is not the final frontier. "Even if you are stuck on the Mars, Indian Embassy there will help you," tweeted the Foreign Minister this morning. Her post appeared to humour one Karan Saini, who joked in a tweet about being "stuck on Mars" without food and questioned when India's next Mars mission was due. Along with Ms Swaraj, India's space agency ISRO was tagged on the tweet. The minister's response to the tweet has drawn 2,200 retweets and over 4,500 'likes' in less than an hour. Among those who responded to Mr Saini's comment were those who criticized him for "mocking someone's good work". Ms Swaraj is among the government's most responsive ministers on Twitter and is known to reply directly to tweets by those who are either in trouble - or even those who are prone to using their social media posts to draw the minister's attention. The minister has over eight million followers on Twitter and is widely appreciated for her personal engagement with those who ask for her assistance, be it for passports or visas or to return home from conflict zones. Recently, Ms Swaraj responded to a Pakistani man who needed a medical visa for his infant son's treatment in India. "No. The child will not suffer. Pls contact Indian High Commission in Pakistan. We will give the medical visa," she assured in her tweet. Earlier this year, the minister said she would personally monitor the response of Indian missions abroad to SOS messages.